The Shops at Georgetown Park is a shopping mall, located in the heart of Georgetown in Washington, DC. The property recently underwent an extensive $80 million renovation transforming it from an inward-facing enclosed mall into a collection of retail spaces with dedicated frontage on both M Street and Wisconsin Avenue. With more than 668 parking spaces, Georgetown Park is also home to the largest parking garage in the area. Remodeling Update: In January 2015, MILLER WALKER Retail Real Estate announced a collaboration with Jamestown LP to lease the restaurants at Georgetown Park. Bill Miller and Alex Walker of MILLER WALKER will lead the leasing efforts on the available spaces, which range in size from 800 square feet to 10,000 square feet. More details to be announced. Pinstripes, a unique entertainment and dining concept opened in January 2014. Combining a blend of bocce courts, bowling lanes, Italian/American cuisine, fine wines, and live jazz music, the facility occupies 34,000 square feet of first and second-floor space of the building. Pinstripes is open seven days a week for lunch and dinner and will be available for private events and parties. Georgetown is not easily accessible by Metro. The best way to get to the Shops at Georgetown Park is by taking the DC Circulator Bus using the Georgetown/Union Station or the Rosslyn/Georgetown/Dupont Circle lines. . The parking garage, with its 668 spaces, is open 24 hours and is the largest in the area. There are two entrances, one on Potomac Street and one on Wisconsin Avenue. Rates are $11 for one hour, $16 for two hours. A Capital Bikeshare station is located on Wisconsin Avenue between the C & O Canal and Grace Episcopal Church. 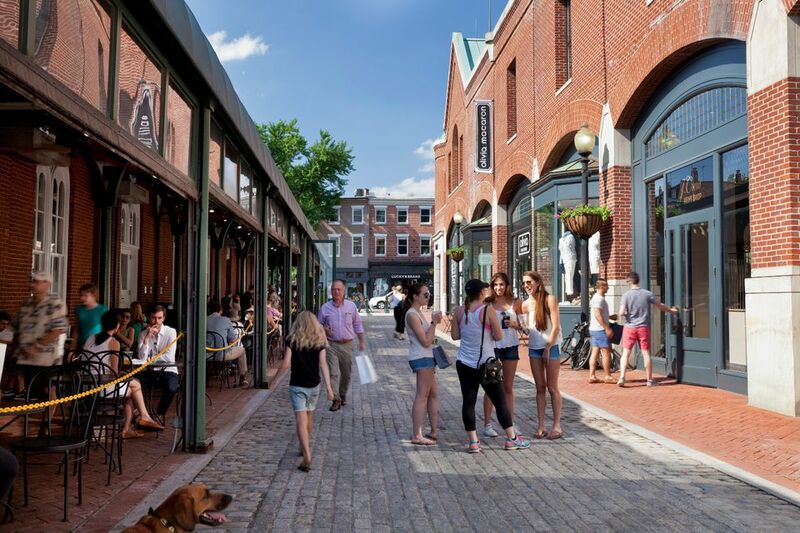 Monday - Saturday - 10 a.m. - 8 p.m.
Georgetown is one of Washington DC's most popular neighborhoods, known for its stylish shops, brick row houses, historic churches and cobblestone streets. It is a fun place to shop with a blend of leading retailers, local boutiques, and a wide variety of restaurants. The area is also home to many cultural and historic attractions.